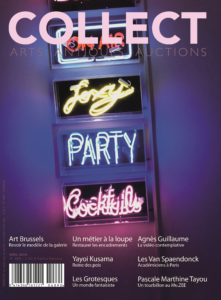 COLLECT Arts Antiques Auctions is the magazine for the art lover and collector. Each issue keeps you up to date on what is hot in the world of art, antiques and design. Every month we discuss top exhibitions that are on show nationally and internationally and take a look at what Belgium's best galleries have to offer. We follow trends in the fields of art, antiques and design and report the latest developments at national and international auctions as well as at art fairs worldwide. Furthermore each issue comprises a very handy calendar that keeps you up to date on all auctions, fairs and exhibitions in Belgium and beyond. The origins of our magazine date back to 1971 with the founding of Arts Antiques Auctions. For years known as the 'AAA' it was the first bilingual Belgian magazine for art lovers. In order to also serve the art lovers in The Netherlands, the art newspaper Kunst & Antiek Journaal was published from 1996 onwards. A decade later both Arts Antiques Auctions and Kunst & Antiek Journaal were thoroughly reformed: the paper Kunst & Antiek Journaal in black and white transformed into a beautiful color magazine, and Arts Antiques Auctions underwent the same fresh design. Moreover, from then on the latter is available in a full French and a full Dutch version. All these changes called for a new name: COLLECT. The name says it all: it is the magazine for the art collector and active art lover. Just because both magazines are very similar both in form and content - many articles are indeed interesting for both our Belgian and Dutch readers – they share their name. But of course each magazine focusses primarily on the art topics in its own country, to subsequently oversee the international landscape. That way, COLLECT Arts Antiques Auctions (Belgium) and COLLECT Kunst Antiek Design (Netherlands) cover the entire art market in the Benelux and are the market leaders in their domain.